The jagged ice covered peaks of Cerro Castillo are one of the most awe-inspiring sites in the Region of Aysén. This great horseback ride gets you up close to the base of the towers where the panoramic views of the Ibáñez River Valley are unsurpassed; from here you?ll walk toward its hanging glaciers and amazing turquoise lagoon. Duration: Six hours, round trip. Special Considerations: For half day horseback rides, personal equipment should be carried in a small backpack, including base, insulating and waterproof layers, a fleece hat, sunglasses and sunblock, camera, personal medicines, and a bottle of water. We also suggest taking a snack for the hiking portion, though some operators will provide one if you ask in advance. Riding equipment like half-chaps and helmets are provided by most tour operators. Reservations: In town there are various operators, each with distinctive circuits and standards. Al Galope la Araucaria (Felidor Sandoval) - Villa Cerro Castillo: Los pioneros 962; (09) 76611709; cabalgatacastillo@gmail.com; mcmarciacarrasco@gmail.com. Baqueanos de la Patagonia (Loreto y Claudio Sandoval) - Villa Cerro Castillo: Camino sector Arroyo el Bosque; (09) 65136226 - 78988550; contacto@baqueanosdelapatagonia.cl. Cabalgata Aventura (Albanio Sandoval) – Sector Alto Puerto Ibáñez: Km 100, Camino Puerto Ibáñez; (09) 87459266 - 98787565; cabalgataventura@live.com. Cabalgata El Gauchito (Juan Villagran) - Villa Cerro Castillo: Fundo la Porfía; pelusita87@gmail.com. Cerro Castillo National Reserve is one of Aysen’s icons; renowned for great hiking, stunning scenery, amazing forests, turquoise waters, hanging glaciers and above all, tremendous towers that call out to the best mountaineers worldwide. You don’t have to mountain climb or hike a lot to explore Cerro Castillo’s marvels. There are horse trips to some of the most beautiful areas in this “don’t miss” National Reserve and you don’t need to be a proficient rider or even have prior experience on horseback. You just need to have an adventurous spirit, average levels of physical fitness and a good pair of hiking shoes for the short, but relatively steep hike at the end of the ride. You’ll saddle up in the gaucho town of Villa Cerro Castillo, situated 110 km south of Coyhaique, at the base of the Reserve. We recommend that you stop in town to have a bite at one of the local restaurants or explore the shops; it’s an interesting place to chat with locals and hear their stories about the mountain and its many adventures. The Villa is filled with gaucho heritage and their horse treks are based on these same traditions. The classic route is offered daily by most operators and includes a six-hour combination of horseback riding and hiking to the Cerro Castillo Glacier Lagoon at the base of the spirals and towers. The adventure leaves from the Villa along an old tropero (cattle-herder) route and gradually climbs the mountain’s slopes winding through a private farm. The trails are narrow, so you should always be alert to the terrain, your horse, and your guide’s instructions. The higher you ride, the more panoramic (and incredible) your view of the Ibáñez River Valley. After about an hour of riding you’ll encounter the El Bosque Stream, which you will follow until you reach the National Reserve’s boundary. Here you’ll will leave your horses and continue on foot. It’s a one-hour trek that follows a series of switchbacks climbing up the rock scree of the Reserve to a height of 1,500 meters. At the top, you’ll be rewarded with unforgettable views in all directions; at your back you can see the entire Ibáñez River valley, all the way to Lago General Carrera and on a clear day, to Argentina. In front, you can see every detail of the mountain, its basalt spires touching the sky and its glacier toppling down from the peaks. From here, the trail flattens out for the final stretch, ending at an overlook of the vividly turquoise Cerro Castillo Glacier Lagoon, formed by glacial melt and colored by sediments carried down from the tips of the spires. Here, you’ll stop for photos, a rest, and a light snack, before finishing walking back down to your waiting horses and completing the circuit back to Villa Cerro Castillo. We suggest working with guides who offer a traditional Patagonia-style asado al palo at the end of the ride. Many have beautiful camping areas or quinchos where you can relax and chow down while sharing stories, photos, and experiences with your guides and the rest of the group. 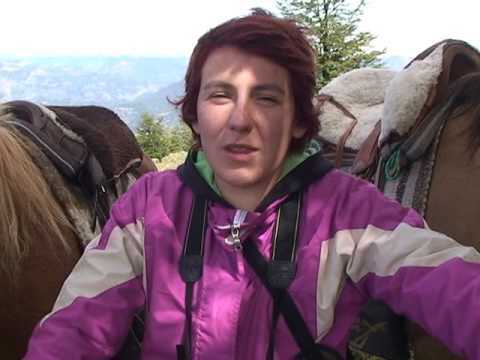 Registration: Focus on the horseback riding providers who are registered as Adventure Tourism Operators with Sernatur; www.sernatur.cl. Condition and health of the horses: How can you tell the difference? Observe the horses at the operator’s facility. Generally, the space between the ribs should not be very noticeable, the hooves should be shod and the hair should be bright and smooth. Ask your provider how many trips each horse does in one day. If they answer more than one, check them out a little more carefully. Quality of the guides: A good operator should have horse guides who are adults, with the ability to provide first aid and a minimum of 5 years working with horses and with clients who have a variety of different experience levels. Furthermore, it’s important that guides should be able to clearly communicate with their clients in their native language. Adequate Equipment: It’s important that your provider has suitable equipment that is in good condition, such as the saddles, reins, half-chaps, blankets, radios and first-aid kit. Looking for a horse trip that’s a little less usual? Ibáñez River Route: This three hour horse trip follows the Ibáñez River and Valley along the base of Cerro Castillo. Excellent photo opportunities! Rivers to Mountains Expedition, Torres de Avellano sector: This is a three day, two night trip, passing through local farms and gaucho outposts in the remote valleys between Cerro Castillo and Lago General Carrera. You’ll share traditional rural customs like drinking yerba mate and cooking beside the fire, while riding through remote backcountry wilderness, untouched by the modern world. You’ll also have the opportunity to stretch your legs, hiking up to a hanging glacier so remote, they haven’t even given it a name.